The 440,000 sq. ft. Daniel L. Ritchie Center for Sports and Wellness is a multi-venue sports facility for varsity athletics. In addition to fitness, it houses major arenas and gymnasiums where students gather to cheer the Pioneers. Magness Arena features 6,200 seats for hockey and 7,200 seats for basketball. Hamilton Gymnasium is home to Denver’s volleyball and gymnastics programs and seats 2,800. The Stapleton Tennis Pavilion has six outdoor courts for varsity competition and practice, plus grandstand seating for more than 300. In 2005, the Peter Barton Lacrosse Stadium opened and accommodates about 2,000 people – the only stadium in the country used solely for lacrosse. 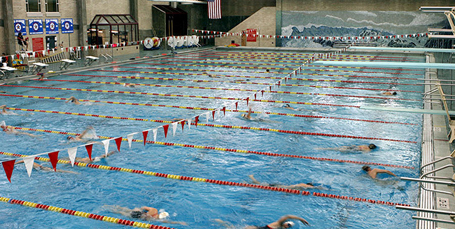 The El Pomar Natatorium features an Olympic-length 50-meter pool designed by Counsilman-Hunsaker with two 3-meter and two 1-meter springboards. The natatorium has permanent seating for 350 and room for additional temporary seating when necessary. Bulkheads are used to create the configuration of seventeen 25-yard lanes or eight 50-meter extra wide lanes. The west wall of the natatorium features a 270 ft. mosaic composed of 19,000 tiles of a watery-blue seascape designed by Maynard Tischler, professor of art at the university.